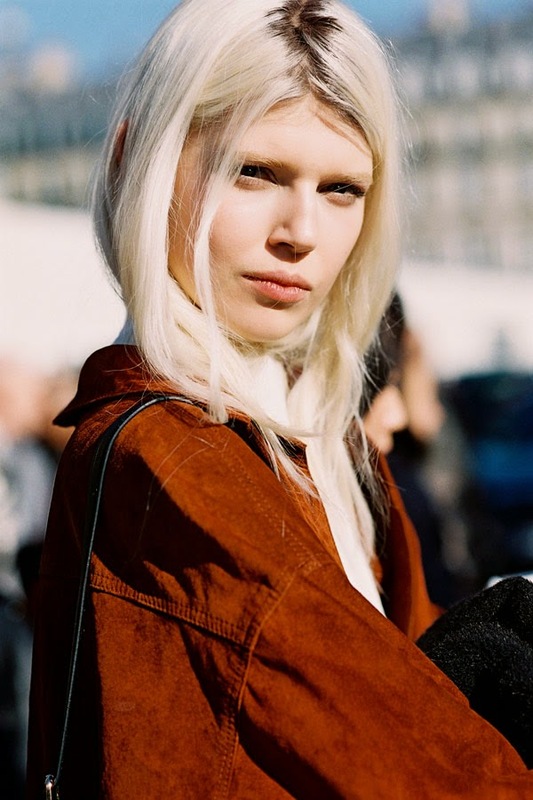 Polish model Ola Rudnicka, after Louis Vuitton, Paris, March 2014. Eleonora Carisi, Lincoln Centre, NYC, September 2014. Art director and fashion consultant Sofia Sanchez Barrenechea , before A Show, NYC, September 2014. LOVE this gorgeous look on Sofia - such a pretty Tome lace top and beautiful bra. And those Giuseppe Zanotti fishbone sandals? wow! J.Crew's Jenna Lyons, after The Row, NYC, September 2014. D.J. and co-founder of Beautified app, Hannah Bronfman, before Michael Kors, NYC, February 2014. Hair and beauty inspiration via Estonian model Alexandra Elizabeth, after Diane von Furstenberg, NYC, September 2014. Chiara Ferragni of The Blonde Salad blog, before Tommy Hilfiger, NYC, September 2014. Natalie Joos of Tales of Endearment, before Diane von Furstenberg (wearing a beautiful DVF gown - beautiful to wear to a summer wedding), NYC, September 2014. Before Alexander Wang, NYC, September 2014. Love this Celine dress....and beautiful sandals as well. 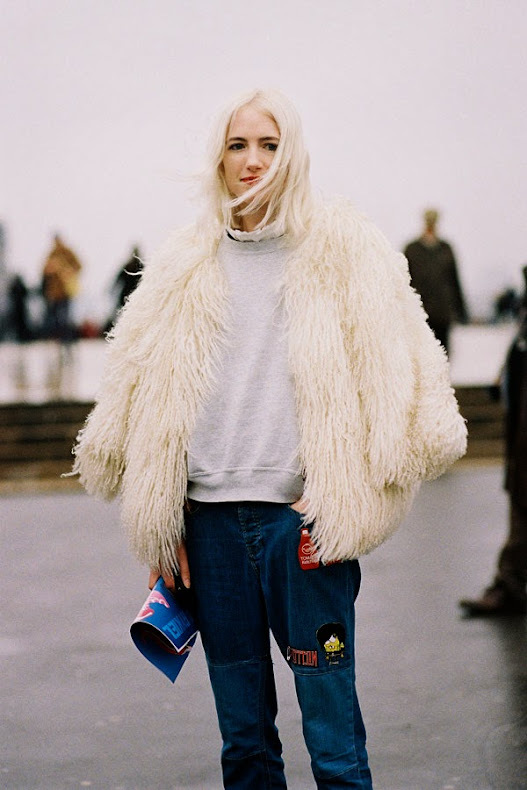 British Fashion Editor and Stylist Phoebe Arnold, after Haider Ackermann, Paris, March 2014. A shaggy coat to keep out the chills (and rain!). Buro 24/7's Miroslava Duma, after Christopher Kane, London, February 2014. An alternative to the poncho/cape and just as snuggly and easy to throw on: the coatigan or cardi-coat. Russian model Valery Kaufman, after Tommy Hilfiger, NYC, September 2014. I loved the make-up at Tommy Hilfiger but only managed to find/photograph one model after the show! I was going back and forth across the street and not achieving very much at all - I felt like I did a lot of that in New York! Gorgeous writer Claire Beermann from C'est Clairette, before Alexander Wang, NYC, September 2014. We were all a little obsessed with photographing Claire in NYC :) Her outfit makes me sad that summer is over for this year. After The Row, NYC, September 2014. Gorgeous ruffle detailing on her pants (they remind me of these trousers worn by Samantha Traina) and beautifully styled with the plaid shirt and sweet Tabitha Simmons flats. Katie Laas, after Diane von Furstenberg, NYC, September 2014. Caroline de Maigret, Lincoln Centre, NYC, September 2014. Caroline has such great (individual) style and the flash of colour across her sweater, accented by her cobalt blue clutch is just so nice. An outfit most girls would feel comfortable wearing in "real life" (as opposed to just "fashion week life!"). Estonian model Alexandra Elizabeth, after Miu Miu, Paris, March 2014. Two gorgeous girls in Valentino: Evangelie Smyrniotaki of Style Heroine and Nicole Warne of Gary Pepper Girl, Tuileries, Paris, March 2014. 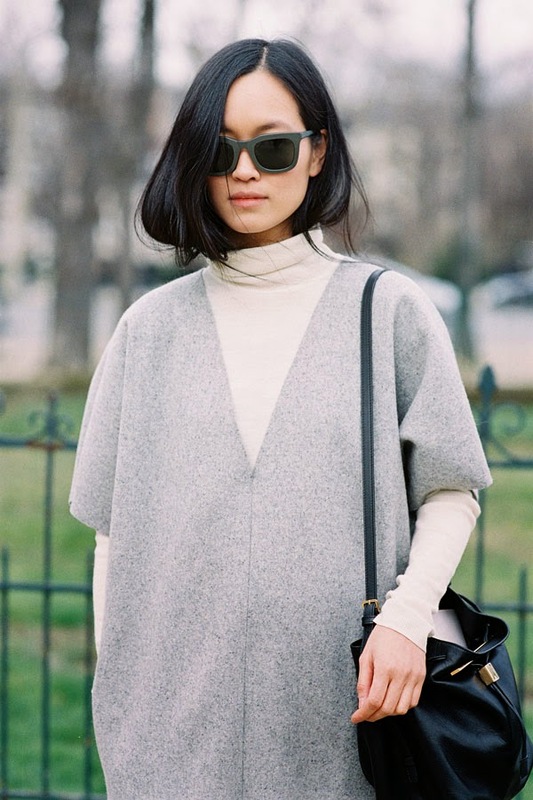 The lovely Maria Van Nguyen, before Chloe, Paris, March 2014. Giovanna Battaglia, Tuileries, Paris, March 2014. The cape. The slingback flats. Giovanna. 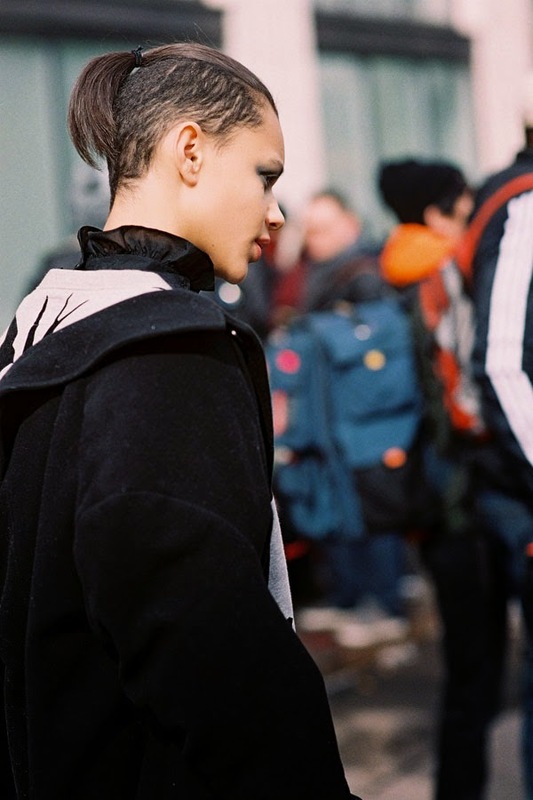 American model Leona Binx Walton, after Derek Lam, NYC, February 2014.